Lautoka City and Nadi Town was abuzz on Christmas Day as 3000 tourists flocked to do their shopping in retail shops and make-shift vendors’ tents at Lautoka Wharf. Tourists from Australia and other countries were sightseeing and buying handicrafts, clothes and souvenirs while others prefered to walk around as the MS Voyager of the Seas cruiseship arrived en route to Sydney. Among the crowd was the Nay family from Sunnybank Hills, Brisbane who had their first visit to Fiji. “This is our first trip and it was very interesting, to be here in Fiji on Christmas Day away from home,” said eighteen-year-old Jacob Nay. “We will probably visit again in the future as we have heard a lot about Fiji from a few friends who came over for holidays,” Jacob said. He said his family wanted to experience a different taste of Christmas this year. “It is different from being in the hotel. You are just above the ocean and it is totally different rather than being at home for Christmas,” Jacob said. Nadi Handicraft manager Anilesh Kumar said it was a great day for business. “With tourist spending money on handicrafts, it was worth sacrificing our Christmas away from home,” Mr Kumar said. Lautoka Chamber of Commerce and Industry administrator Salim Mohammed said it was an extra day of business in the Western Division. “Their arrival with a total capacity of 3000 passengers, on Christmas Day is good for the Lautoka City and other services providers,” he said. The cruise liner is on route to Sydney and its last stop is Noumea, New Caledonia. 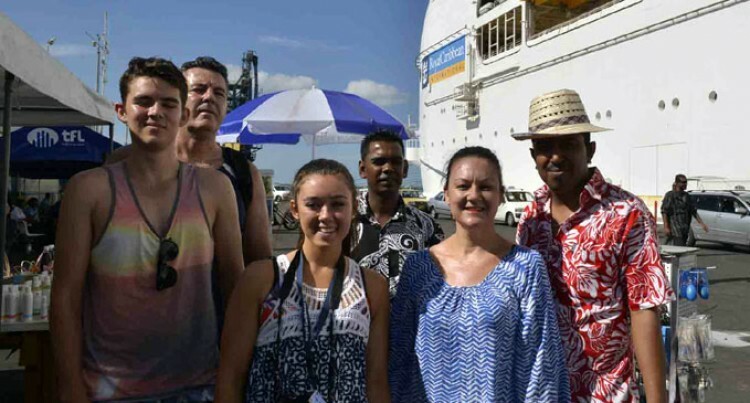 Mr Mohammed said the last cruise liner of the year arrives at Lautoka Wharf on December 29.